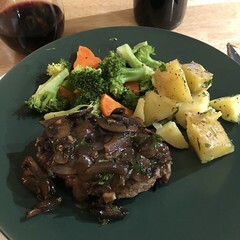 Inspired by our own recipe for mini meatballs and mushrooms, we have our own take on the comfort food Salisbury Steak. As we’ve done our research, it seems (at least according ti Wikipedia) that the dish was named after an American doctor, James H. Salisbury in the late 1800’s. I believe it really caught on in the 50’s and 60’s when the infamous TV Dinners became popular. 1. Create the steaks. In a large bowl, mix the ground beef and/or veal with the Worcestershire sauce, 1 or 2 tbsp olive oil, diced onions, diced garlic, bread crumbs, beaten egg, parsley, salt and pepper. Shape the steak patties to your liking. 2. You can grill the steaks while you are making the mushroom sauce or you can grill them first and set them aside. 3. Using 2-3 tbsp of olive oil preheated in a medium sized pan, sauté the onions, garlic and (optional) hot pepper flakes. 4. Once the onions show signs of transparency and the garlic softens, add the mushrooms and mix well. 4. Once the mushrooms have cooked for a few minutes add 1 tbsp butter, let the butter melt and add a cup of beef stock. 5. Once the ‘sauce’ comes back to a simmer, add 1/4 cup Worcestershire and 2 tbsp Zio’s Browning Sauce. 7. Add a tbsp of cornstarch to help thicken the gravy. 8. Finish with some fresh cut flat-leaf parsley.